If you don't understand why the company wants to move to crypto, you haven't been paying attention. Recently, Overstock.com (NASDAQ:OSTK) has become less known for its retail operations and more as a cryptocurrency play as shares advanced about 500% earlier this year. But in the last two months, shares have given back much of those gains. You can't help but notice the similarities between the price action of Overstock.com shares and that of the most popular cryptocurrency: bitcoin. CEO Patrick Byrne, an early cryptocurrency convert who believes "bitcoin is more powerful than physical money", has continued to position his company as a cryptocurrency business. Earlier this year, Overstock's blockchain-based venture capital subsidiary, Medici Ventures, conducted a $250 million tZERO security token ICO (initial coin offering) to fund its trading system of the same name. Additionally, Overstock.com CFO Robert Hughes left the company to join DeSoto Inc, a blockchain-technology joint venture that's a Medici portfolio company. On the company's last earnings call, executives led with blockchain-related announcements, discussing the core retail business later in the discussion. Although it's obvious Byrne is a crypto convert, there's another reason for the pivot to crypto: The core retailing business is struggling. Our retail operating margin -- now we've added Amazon to this picture. You can see they had, I think, two years of -- it looks like positive. They've slipped back under in a small way. We have now gone negative in our operating margin, and I view that very much as competition from having this kamikaze competitor who has come into our field. It's very tough to run a business making $20 million, $30 million when you have a copycat [Wayfair] who's losing a quarter billion. During the fourth quarter, the company reported a pre-tax loss of $24.9 million, attributing $17.6 million to retail and $7.3 million to Medici Ventures. In the next quarter, losses accelerated to $54.7 million. Will Byrne go full crypto? In December, Byrne surprised Overstock investors by floating the suggestion he would sell the e-commerce business within "60 to 90 days" to fully commit the firm to crypto. While he hasn't acted upon this declaration, and doing so could spur investor lawsuits, it's apparent he's steering the firm in that direction. In addition to leading the company's conference call with tZERO, the rapid increase of pre-tax losses assigned to Medici suggests significant spend in the segment. It's understandable that Byrne would like to pivot to a business he feels has a larger runway for growth rather than compete against Wayfair and Amazon in a race to the bottom of operating margins. 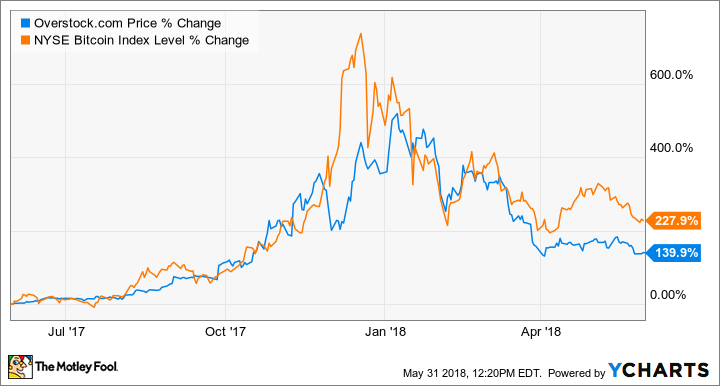 But investors, at least at this point, should continue to value the company as a struggling retailer rather than a cryptocurrency play.